Bee Pollen is made by honeybees, and is the food of the young bee. It is considered one of natures most completely nourishing foods as it contains EVERY nutrient required by the human body. Bee pollen is a complete food and contains many elements that products of animal origin do not possess . Bee pollen is richer in proteins than any animal source. It contains more amino acids than beef, eggs or cheese of equal weight. The most amazing part to the whole journey of bees producing pollen, is it takes one bee working eight hours a day for one month to gather a teaspoon. This is why bees are so key to our food supply . Bees sustain our whole ecosystem and without them we do not have a food chain or supply. APPLE CIDER VINEGAR - is full of enzymes and good bacteria. It contains acetic acid, which has been shown to lower blood pressure up to 6 percent. It can also help eat up the starches if you do eat grains in your diet. LEMON JUICE - helps balance blood sugar and has an alkaline effect on your body helping to regulate PH. It also contains vitamin C.
CINNAMON - is one of the best antioxidants on the planet. It’s the number one herb/spice for balancing blood sugar. CAYENNE PEPPER - has been shown to drop blood pressure, increase metabolism. STEVIA - is an all-natural sweetener made from the stevia plant, and it’s a great replacement for any artificial sweeteners being a herb. Every known physical illness is associated with a magnesium deficiency. Magnesium is the most critical mineral required for electrical stability of every cell in the body. A magnesium deficiency may be responsible for more diseases than any other nutrient. Junk food diets lack magnesium and isolated supplements in the form on the shelf type only stress the liver out. Cacao is natures best magnesium hit to allow the body the perfect uptake to create emotional and physical change at a deep cellular level by being a food. Cacao is so brilliant for heart health, mood lifting, intelligence boosting, protects the skin, lowers stress levels and metabolism. You can see instantly how wide the range is within the body and its powerful effect. Coconut oil is high in natural saturated fats. Saturated fats not only increase the healthy cholesterol (known as HDL) in your body, but also help to convert the LDL “bad” cholesterol into good cholesterols. By Increasing the HDL's in the body, it helps promote heart health, and lower the risk of heart disease. Coconut Oil is such a diverse food and can be used as toothpaste, moisturiser, for hair, to cook with, oil pulling (remove toxins) and sunscreen. The list is endless! There's nothing nicer to start the day than a soothing cup of herbal tea. Besides being a tasty, warming, caffeine-free pick-me-up, herbal tea has lots of wonderful health benefits. From soothing a troubled tummy to easing insomnia and calming a troubled mind, herbs have all sorts of healing powers. Most people look to a stimulant like coffee when they think warm drinks, but herbal tea has many healing benefits and works deeply through all our body and organs . When choosing a tea always go for organic, unbleached and ethically sourced type. The traditional benefits of goji berry use are attributed to it's neutral or balanced energy (neither warming, nor cooling) and it's tonifying effect on the Blood, Kidney, Liver and Lungs. This alkalising herbal adaptogen has been used for thousands of years in China. It is enjoyed above all other live superfoods and adaptogenic herbs because it is much more palatable compared to many of the other bitter roots and barks that may have equally impressive medicinal qualities, but aren't as tasty. Wild organic goji berries grow naturally in Asia and North/Central America. They grow everywhere from the extreme rugged Himalayan mountains to the searing hot lowland Arizona desert. This unique adaptogenic ability to integrate into various climates is one of the benefits of goji berry use that is passed along to whoever consumes it. Goji Berries are a great and easy snack to have on hand and work deeply within our bodies to bring the energy we need during the day or the calmness we might crave . A purely brilliant adaptogen. 1. Turmeric contains bioactive compounds with powerful medicinal properties. 2. Curcumin is a natural anti-inflammatory compound. 3. Turmeric dramatically increases the antioxidant capacity of the body. 4. Curcumin boosts brain-derived neurotrophic factor, linked to improved brain function and a lower risk of brain diseases. 5. Curcumin leads to various improvements that should lower your risk of heart disease. 9. Studies show that curcumin has incredible benefits against depression. 10. Curcumin may help delay aging and fight age-related chronic diseases. Greens are fantastic for our health, Green Superfoods are even better! Every morning try to add a Green Superfood to your day. Green Superfoods have the highest concentrations of easily digestible nutrients, fat burning compounds, vitamins and minerals to protect and heal the body. They contain a wide array of beneficial substances including proteins, protective photo-chemicals and healthy bacteria helping you to build cleaner muscles and tissues, aid your digestive system function and more effectively protect you against disease and illness. Green Superfoods are extremely rich in chlorophyll - the pigment that gives plants their green colour. The molecular structure of chlorophyll is very similar to that of human blood and studies show that when this is consumed, the production of haemoglobin in blood is increased. Higher amounts of haemoglobin in the bloodstream means more oxygen-rich blood, the first and most important element that cells need to thrive. Wheat grass, Barley grass, Wild blue-green algae, Spirulina, Chlorella and Green leafy vegetables. 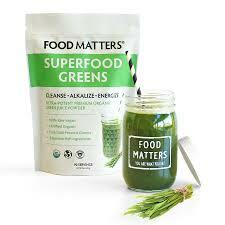 We use a fantastic product made by Food Matters as it is cut and cold pressed in low temperatures. This gifts Higher nutrient density, Dissolves in water and is 100% raw. They help to alkalize our blood, neutralizing the over-acid effects of our modern diet and protect us from a wide array of toxic elements in the environment, including heavy metals, pollutants and radiation by-products converting them to harmless salts that the body can eliminate. But the most remarkable results with seaweeds we see is boosting weight loss and deterring cellulite build-up. The high concentration of natural iodine helps to stimulate the thyroid gland so that food fuels are used before they can be turned into fatty deposits. At the same time, the minerals act like electrolytes to break the chemical bond that seals the fat cells allowing trapped wastes to escape. Both by eating sea vegetables or bathing in them helps reduce cellulite and stimulates lymphatic drainage. Nori, Kelp, Dulse, Arame, Wakame, Kombu are some of the varieties which gift all these miraculous properties to the body. Pure Organic Celtic Sea Salt is hand-mined salt derived from ancient sea salt deposits. It is believed to be one of the purest forms of salt available. Himalayan and Celtic salt provide essential minerals and trace elements and contain 84 natural elements required by the body. - Promote bone and circulatory health. - Promotes healthy brain function. Enjoy a good pinch on your meals and smoothies. 1 -Soak 2 cups of nuts (almonds, brazil, chashew, hemp) for at least 12 hours in pure water with ½ tsp sea salt. 2 - Blend for several minutes until smooth and creamy. 3 - Strain mixture into a large bowl through a sprout bag, cheese cloth or kitchen towel. 4 - Put mixture back into blender with vanilla, soaked dates, or other sweetener. Easy quick and tastes amazing. 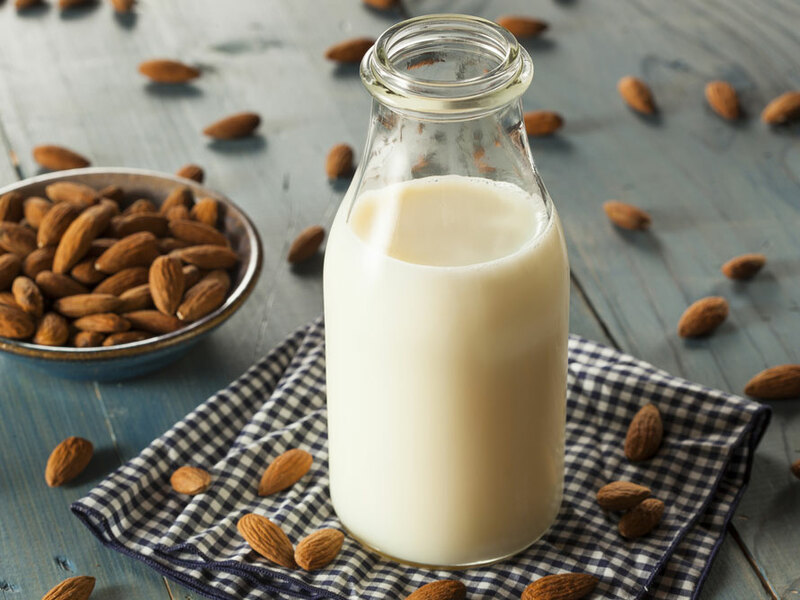 Nut milks are simply non-dairy containing milks made out of 1) filtered water, 2) nut or seed of your choice, and 3) possible flavour additions. Nut milks are a perfect way to still enjoy the versatility of cows milk without the dairy proteins involved (which are typically the cause of inflammation/allergic reactions); it’s easier on digestion, tastes great, humane, environmentally sustainable, easy to make and affordable. “Where will I get my calcium and vitamin D if I don’t drink my milk?” This is a routine question so many people ask and it's not your fault at all- it’s the working of good marketing from the Dairy Council and traditions of drilling into our heads that milk = the only source of calcium and vitamin D in our diets. Well unfortunately this is wrong. Calcium is widely presented in many plant-based foods, for example did you know 100g of broccoli rabe contains about 100mg of calcium? Even higher in calcium is the sesame seed, 1 cup of sesame seeds is equal to about 1400mg of calcium and 100g almonds has about 380mg of calcium. As far as vitamin D goes, going outside daily for about 20-30 minutes (depending on your skin tone) during the day of highest sun and you’ll get adequate amounts. Many Nut Milks contain fantastic minerals like calcium, iron, magnesium, phosphorus, potassium, sodium, and zinc. The other nutrients available in nut milks include vitamins such as vitamin C, vitamin B6, thiamine, riboflavin, niacin, folate and vitamin E. All these nutrients have various benefits which are essential for a healthy body.